The story behind the quote: This week’s quote comes from The Fault in Our Stars. The book was written by John Green and it was adapted into a feature film in 2014. The film is about Hazel Grace Lancaster (played by Shailene Woodley), a terminally ill cancer patient who falls in love with Augustus Waters (played by Ansel Elgort), a bone cancer survivor and amputee. The quote comes fairly early in the film. Hazel is attracted to Agustus and the feeling is mutual. However, as she knows she’s going to die because of the cancer, she tries to keep him at arms distance because she doesn’t want him to feel depressed when she eventually passes. This is when Augustus delivers the quote. Geek wisdom: Falling in love and being with that person is taking risk since there is no guarantee the love you feel now will last forever. But the feeling of being with the person you love, even if it’s just for a little while, is worth it. The story behind the quote: This week’s quote was submitted by Hazel Lance! Thanks, Hazel! You can check out her other written stuff by checking out her WordPress blogsite (poeticfangirl.wordpress.com)! 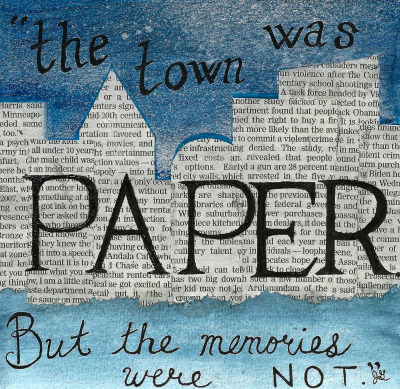 The quote comes from the book Paper Towns by John Green, the author that gave us The Fault in Our Stars. And, like The Fault in Our Stars, Paper Towns is going to be made into a feature length film. Fair warning: the quote and Geek Wisdom may contain SPOILERS for the upcoming film. Anyway, Paper Towns is all about Quentin Jacobson, Q to his friends, who has a massive crush on his next door neighbor, Margo Roth Spiegelman. After being ignored by her throughout high school, Q is surprised to see Margo ask for his help in getting revenge on her ex-boyfriend for cheating on her. The next day, Q finds out that Margo is now missing and Q believes he is the only one who can find her. The quote comes as Q’s graduation date draws near. He realizes that, although, the people around him were indeed materialistic and “unreal, he still treasures the memories he has with them. This is precisely why graduating makes him feel a little sad. Geek wisdom: We come across a lot of people who end up being someone different from what we thought they were. These people may have been selfish and never cared much about us, but the memories would always bring a smile to our face because we were genuinely happy in that moment.